This book weaves together theory, research, and practical information related to the psychological aspects of physical education. Unlike other exercise/sport psychology books on the market, The Psychology of Teaching Physical Education is written especially for future and practicing physical educators and focuses on the psychological principles and strategies that are most relevant to them. The book covers the important topics of motivation, reinforcement, feedback, modeling, prosocial behaviors/moral development, and self-perception. 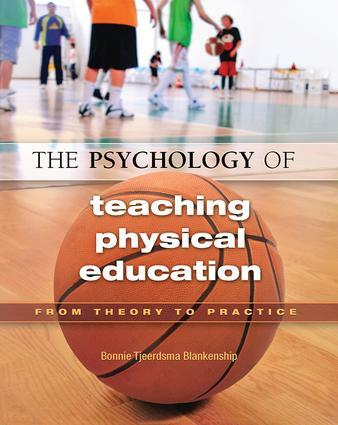 In each chapter, narratives about real practicing teachers show how they apply the principles and theories of psychology to physical education, and particularly to actual situations that readers are likely to encounter professionally. Each chapter contains three main sections: following an opening scenario in which Blankenship captures the reader's attention with a real-life problem, the author then (1) highlights theories related to the subject matter of the chapter, (2) summarizes the research that has been conducted on the theories and the chapter topic, and (3) gives examples of practical applications of the theory and research to physical education. Throughout the chapter, as the theory, research, and application of the topic are discussed, Blankenship presents possible solutions to the challenge presented in the chapter-opening vignette. The classroom applications and real-world examples are relevant to many different physical education settings, including those at the elementary, middle, and high school levels, in both urban and rural schools representing various geographical regions of the country. These examples bring the theories to life and help readers envision how their own classes will benefit as they apply what theyÃ­ve learned about the psychology of teaching physical education. An author whose background in both sport psychology and physical education makes her uniquely qualified to write this book. Chapter-ending application exercises that encourage readers to go beyond rote memorization of concepts and principles to apply what they learned in various specific examples. Sample instructional models and guidelines to enable readers to incorporate concepts discussed in the chapter into their own classes. Bonnie T. Blankenship is an associate professor in the Department of Health and Kinesiology at Purdue University, US. She received her master's degree from the University of North Carolina at Greensboro and her doctorate from the University of South Carolina. Prior to going to Purdue, she taught at Old Dominion and Georgia State universities. Her research interests focus on teacher education, especially the assessment of teacher education programs, as well as assessing the effectiveness of youth activity and physical education programs. Another area of interest is the application of sport and exercise psychology principles to the teaching of physical education. She regularly presents at national conferences and has published work in the Journal of Teaching in Physical Education (JTPE), Quest, Teaching and Teacher Education, Journal of Physical Education, Recreation, and Dance (JOPERD), and Strategies.